Arachnoiditis ossificans represents chronic arachnoiditis characterized by calcification and/or ossification. Unlike adhesive arachnoiditis, arachnoiditis ossificans can be treated with surgery  in patients with severe or deteriorating symptoms. However, surgery remains a controversial treatment option because excision of the dural calcification and microsurgical neurolysis is technically difficult, particularly when multiple nerve roots are involved and even if surgical removal of the intrathecal ossification is possible, the clinical outcome is generally poor. We analyze the clinical symptoms, radiological findings, and treatment options in a patient diagnosed of post traumatic arachnoiditis ossificans with a brief review of literature. A 21-year-old male who sustained an injury in a fall from a tree 2 years back, presented with history of chronic progressive low back pain and left foot drop. There was no evidence of myelopathy. Higher mental functions, tone, power of the limbs were normal. There were no other neurological deficits. Radiograph of LS-spine showed only burst fracture of L4 vertebra. Non-contrast CT revealed a burst fracture of L4 vertebra with mild posterior retropulsion. There were intrathecal ossifications in the spinal canal extending from L4-S2 level with nerve roots exiting through the ossifications. These features are suggestive of arachnoiditis ossificans [Figure 1] a-d.
MRI was also done to see if there was any associated clumping of nerve roots/any associated pathology. MRI showed the burst fracture of L4 vertebra. 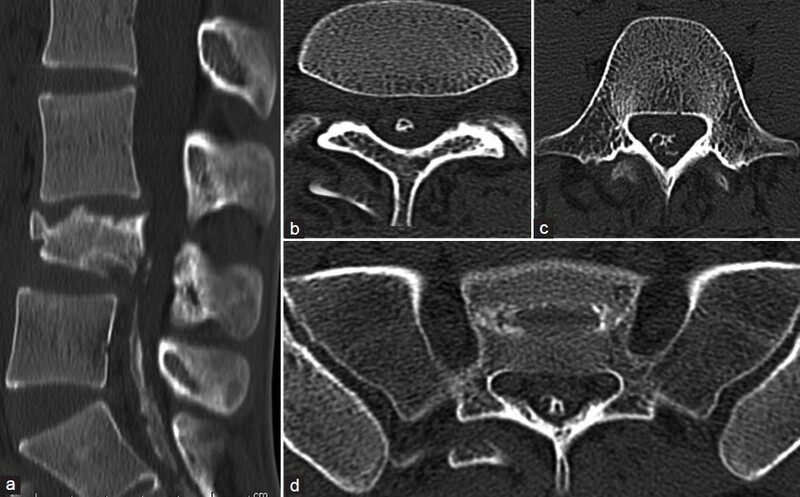 On T1 images, the intrathecal ossification was hyperintense on T1 images and hypointense on T2 images [Figure 2]a and b. There was no clumping of nerve roots at any level. Since the patient declined surgery, conservative management for pain and physiotherapy was offered. In our case, the burst fracture of L4 vertebral body shows posterior cortical breech, and thus the seeded bony fragments might have resulted in chronic inflammatory reaction over a period of two years, which led to arachnoiditis ossificans for which the patient presented with the history of progressive neurological deficit. Unenhanced CT is sensitive to diagnose this disorder and is also useful to evaluate the full extension of the ossified mass if surgical intervention is needed. On MR imaging, the findings could be minimal. There can be nerve root clumping, which is best demonstrated on axial T2-weighted images. The arachnoid calcification is difficult to identify using MRI because of their variable signal intensities. They can be hypointense or hyperintense in T1-weighted images and in T2-weighted images, and the calcifications or ossifications can vary from hypointense to hyperintense. Thus, it is important to verify the arachnoid ossification by CT scan, if arachnoiditis ossificans is suspected in the MRI scan. 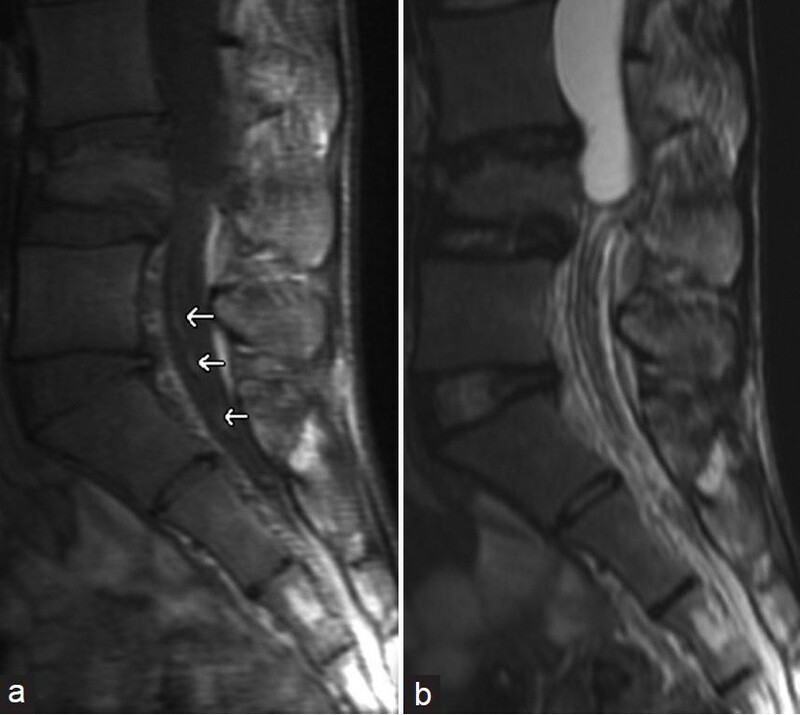 MR appearances of arachnoiditis ossificans has gained more significance because of the decline in the use of CT with corresponding rise in the use of MR imaging for the assessment of low back pain by the present day radiologist. MRI is also important to assess associated pathologic conditions like arachnoid cysts, intramedullary cysts and syringomyelia. Conventional radiographs rarely show the abnormality unless it is extensive, and thus CT is the imaging modality of choice. Arachnoiditis ossificans is a rare entity. CT is the imaging modality of choice to evaluate the full extension of the ossified mass. MRI is needed to assess associated pathologic conditions, clumping of nerve roots and to differentiate a compressive mass lesion which simulates arachnoiditis ossificans. If the symptoms are mild, conservative management is recommended. In patients with severe or deteriorating symptoms, surgery is often performed and even with surgical removal, the clinical outcome is generally poor. 1. Frizzell B, Kaplan P, Dussault R, Sevick R. Arachnoiditis Ossificans MR Imaging Features in Five Patients. AJR Am J Roentgenol 2001;177:461-4. 3. Junewick J, Culver SK. Arachnoiditis ossificans in a pediatric patient. Pediatr Radiol 2010;40:228. 4. Kaufman AB, Dunsmore RH. Clinicopathological considerations in spinal meningeal calcification and ossification. Neurology 1971;21:1243-8. 5. Braz A, Gonçalves C, Diogo C, Reis FC. Arachnoiditis ossificans. Acta Med Port 2003;16:183-4. 6. Jaspan T, Preston BJ, Mulholland RC, Webb JK. The CT appearances of arachnoiditis ossificans. Spine (Phila Pa 1976) 1990;15:148-51. 7. Chan CC, Lau PY, Sun LK, Lo SS. Arachnoiditis ossificans. Hong Kong Med J 2009;15:146-8. 8. Domenicucci M, Ramieri A, Passacantilli E, Russo N, Trasimeni G, Delfini R. Spinal arachnoiditis ossificans: Report of three cases. Neurosurgery 2004;55:985.